We love the beginning of every season, but summer truly has our hearts. This time of year, we crack open the windows and let the fresh air and sunshine stream in. We rediscover our spaces with fresh eyes. Though we believe in timeless design, we also believe in highlighting the seasons and making the most of what you have. As the ubiquitous gathering place of family and friends, the space that makes the most impact is the kitchen. In addition to fresh flowers and summery produce, we found a few items that will update your space for a current look and inviting feel. You can find similar items at any price point, we’re sharing some of our favorite picks. It’s no secret we love the look and feel of pristine marble countertops, but we know they’re not realistic for everyone. We think these Karl Bowls are the perfect accessory for marble lovers and would definitely uplevel your pistachios or any summer treat. We also found these nature-inspired scents from Jayson Home - we’re in love with anything in a simple and modern black glass jar. We’ll take a Big Sur and a Grass & Cedar, please. 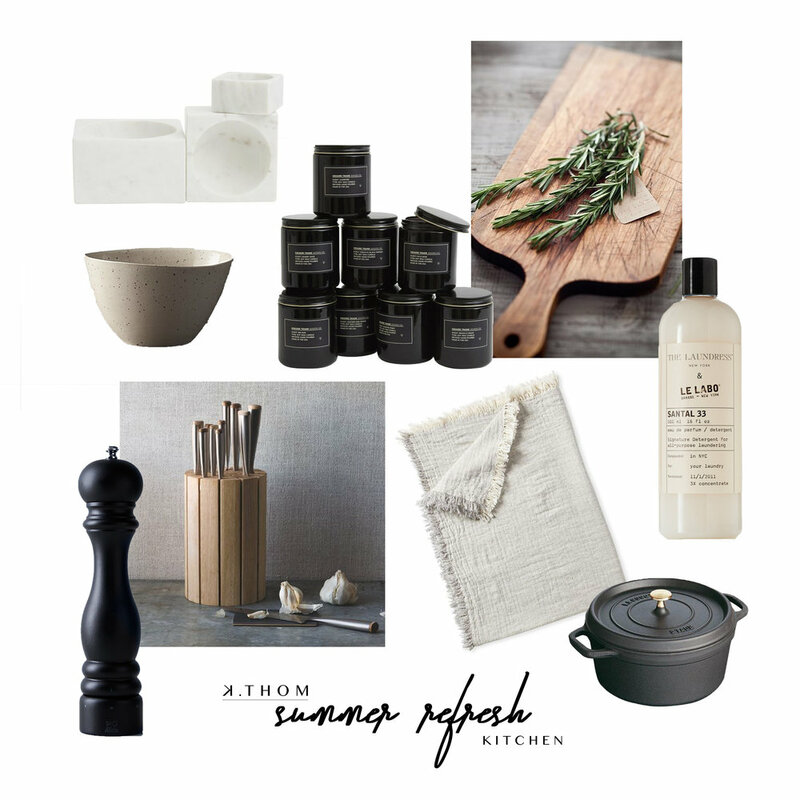 We think everyone should have a collection of wood cutting boards and earthy pottery pieces. You can find boards and stoneware anywhere at any price point, but we think this Wilder Bowl is a stylish pick and we love the mix of earth tones in this set of nesting bowls. We’re also into unique wood knife blocks - this one from Schmidt Brothers Cutlery caught our eye. *these are not sponsored posts. We simply enjoy sharing our finds and inspiration with you.